Students Need Arts To Succeed, Help Out With The ArtsForLA Survey! Right now our schools have a major opportunity to improve education for every child, and your voice is an important part of the process. Will you take a few minutes and fill out this 5-question survey about your school and child? 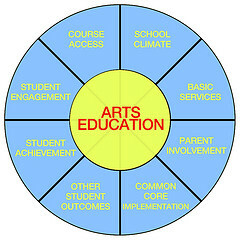 This information will help us advocate for a complete education that includes the arts for every child in our region. The link will remain open through March 12 and is also available in Spanish. Please share this survey with your network. The Local Control Funding Formula (LCFF) is a new education policy in Calfornia. Under LCFF every California public school will get more money to use on programs and resources that help students do well in school. As a parent, teacher, administrator, or child advocate, your opinions are essential to helping Arts for LA and our partners understand what our kids need to succeed. LCFF gives school districts more flexibility and control over how money is used for students. It also gives the community a strong voice in the process to set goals for their school district. Everyone can participate in the planning process through the Local Control & Accountability Plan (LCAP) and by talking with school board members about what students need for success. There are many ways to be heard in the process, so whether you have just a few minutes or even a few evenings to contribute, you can help make a difference. Click here to tell us about LCFF in your district. If you would like more information, visit our LCFF information page or contact Cristina Pacheco, Advocacy Manager at Arts for LA atcpacheco@artsforla.org.